"This is a chocolate and coffee-lover's favorite! Using a home espresso machine, mix espresso, chocolate, and steamed milk--then top with whipped cream." Pour milk into a steaming pitcher and heat to 145 degrees F to 165 degrees F (65 to 70 degrees C) using the steaming wand. Measure the chocolate syrup into a large coffee mug. Brew espresso, then add to mug. Pour the steamed milk into the mug, using a spoon to hold back the foam. Top with whipped cream. A lot of milk, but if you like it creamy this is a good recipe. 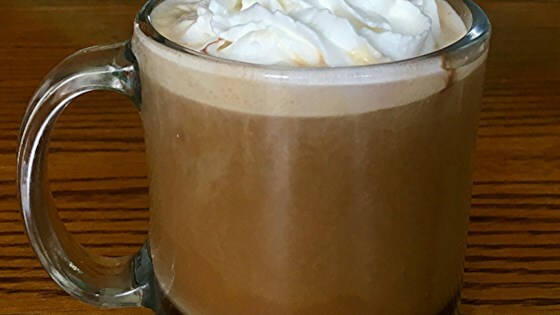 I use half as much milk and this is a perfect basic recipe for a mocha latte. This was ok. I think there needs to be more chocolate syrup. Yummy! Also good with a splash of mint or peppermint flavor. This makes a decent mocha. It wasn't overwhelmingly awesome, but pretty tasty. I followed the recipe and I added homemade whipped cream on top. I also dusted the top with cinnamon and nutmeg. just what I needed on a cold snowy day - definitely did NOT want to have to leave the house for one. Skipped the whip, but loved it.